The 2015 Atlanta International Gift and Home Furnishing Market is for retail buyers to purchase products for their business'. It is also where artists can meet with art directors that license art for their companies products, get contact information on where to submit art, get inspiration for creating new art, learn about the licensing industry and see trends. Note: Since this is a trade show for buyers, it is difficult for artists to attend unless they have the right credentials. For suggestions on how artist can attend the show, read "Art Licensing Editorial: 2014 Atlanta Gift Show - insights on walking the show"
The Atlanta Gift show was booming this year with huge crowds in comparison to the last several years. And, the Reps in the showrooms were extremely busy writing up lots of orders. Although not everyone attending the show feel that the attendance is up significantly from last year like I do, the hallways and showrooms were often at times difficult to get through because of the crush of people. Also, the elevators were so slow and full that most people used the escalators (which were also full) or even the stairs to access the 20 floors in Building one, 18 in Building 2, and 15 in Building 3. Note: As with all trade shows, not all showrooms were doing as well as those that had a huge selection of SKUs (stock keeping units), were not selling only to a niche market, or were a distributor that represented multiple manufacturers. Tidbit: Because taking photographs inside the AmericasMart is prohibited unless you have permission, I instead took two photos from outside. The photo at the top shows the 8:30AM rush of exhibitors streaming into Building 1. It is across the street from the Peachtree Station for MARTA rapid transit system. Once you are in any of the three buildings comprising the Mart's campus you can get to the other buildings via bridges that are located on certain floors. The photo at the left is of a 120-foot long (8 stories if each story is 15 feet tall) escalator from the MARTA railway to the street level. The three 120-foot long escalators at the Peachtree Station are considered the longest escalators in the Southeast. 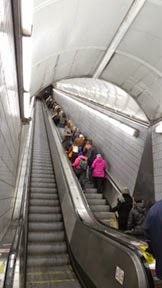 Because so many people use MARTA and the escalators during the 8:30AM rush to get to the MART for the 9AM opening of the show, sometimes security is forced to hold people back so that there are not as many on the escalator at the same time. Otherwise, the weight of people and luggage would shut it down. I find it mind boggling that when the escalators are not as busy, riders like me need to move to the right because those that have the stamina literally run up it on the left. Gasp! There did not seem to be any "NEW" trends at Atlanta but coastal images were showcased in lots of showrooms. I was really surprised because the last I heard coastal was considered kind-of-a niche theme. When I questioned one showroom Reps if the Mart had sent out a flyer asking the exhibitors to showcase coastal, she laughed and said "No, it is just popular right now." She also said that coastal products are not just sold in stores on the east and west coasts of the US but in stores along the many waterways throughout it. Most of the coastal art and products in the showrooms and in the temporary booths had a distressed patina look although there still were a variety of other art styles. Other than coastal I did not see many other themes stand out. But the usual rustic looking products with a distressed finish on them were visible as well as distressed finished American flags on many products from kitchen products to handbags. If there was anything really trending at the show, it was the distressed look with unsaturated color palettes for all kinds of themes. Of course, the typical popular themes usually seen at the show and seem to be the staple for home and gift products were abundant. These included flowers, butterflies, birds, grapes and wine, cats, dogs, owls, cupcakes, coffee, high heel shoes, inspirational words either alone or with art including lots of angels. Also popular were seasonal, holiday and special occasion art such as for Valentines Day, Easter, Thanksgiving, and Halloween. And, do not forget the most popular holiday of all – Christmas. Showrooms had major displays centered on either Santa or snowmen, but over all there seemed to be a fairly even distribution of both. Other Christmas images seen were snowflakes, polar bears, penguins, deer, nutcrackers, angels, Christmas trees, white foxes, owls, partridges, more amaryllis flowers than poinsettias, pinecones and needles, presents, and ornaments. As usual, the use of colors for art depended on the type of product and what it was used for. The traditional red and green were predominating for Christmas art with the exception if the art style was graphical or whimsical for a younger consumer. Then a bright red and chartreuse green were used. Unsaturated and muted colors are still used for home decor but brighter colors are starting to appear on products in some home decor showrooms. Last year chalkboard art was everywhere on products at the Mart but this year it was not prevalent. Even though there are still evidence of owls and red foxes, the whole concept of the woodland theme seemed to be on the back burner. The anticipated next new woodland creature "the hedgehog" was missing from most products with the exception of stuffed animals. The key to getting the most out of the Atlanta Gift Show is to be prepared. A month before the show is a good time to ask art directors for an appointment to show them your art. Although, I am finding that in most cases when artists ask for an appointment they tell you to just drop-in. Appointment times seem to be saved for art licensing agents that have more art to show. Bring business cards, postcards and if possible an iPad with your art on it. It is now the standard to show art with an iPad when attending Atlanta. You never can tell when you ask for contact information if you will also be able to show your art to an art director. It happens to me all the time. Wear comfortable shoes and take plenty of breaks to overcome exhaustion and sensory overload and to write notes. Asking questions from EVERYONE attending the show is a must if you want to take full advantage of attending the show. Talking to buyers, Reps, art directors, and other artists is huge because it gives you information about all aspects of the art licensing industry and gives you a better understanding of it. I drum-up conversations with people anywhere - while taking a break, waiting in line for food or an artist signing, on MARTA, and in showrooms. This is the most friendliest trade show that I have ever attended and everyone loves to talk about products and their business. Having a big smile on your face goes a long way and I am always amazed when busy Reps and art directors are willing to show me their products and talk about them even though they know I am not a buyer. 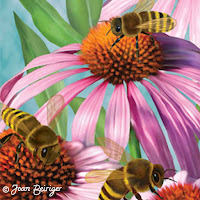 It gives me the opportunity to ask what are good sellers, the artists that created them, and what themes do best. Getting any information is huge in understanding the industry that I would not get it unless I asked. This year I even went into showrooms that I assume only used in-house designers (most of the art look like the same artist created it) and got a big surprise. Several of these manufacturers also license art from free-lance artists. And, the Reps even spent some time showing me the products that they licensed and of course gave me the contact information to submit art. Huge! So make sure you talk to everyone and ask lots of questions when you attend the show. Traveling and hotel problems happen all the time to those attending trade shows. For this show I was one of the unlucky souls that experienced airline and hotel woes where everything went wrong; airline delays, broken MARTA train and standing outside in freezing weather for 20 minutes until another train arrived and then the clincher - no room at the inn. Every year there seems to be a lot of broken pipes at the hotels in Atlanta during the Atlanta Gift Show. But the broken water pipe excuse is really a euphemism for over booking hotel rooms. 5-6% of booked rooms in hotels are no-show, so hotels make the practice of overbooking with first come first serve. I do not know about other customers but with me it really cost the hotel that gave away my room. I paid for it four months in advance and had to wait over two hours for them to find me a room in another hotel. They paid an $85 taxi fare to the new hotel with a free night lodging and a customer that will never book with them again. It is not fun to spend all day on an airplane, have hours of layovers at airports, and not get a hotel room until 1AM. 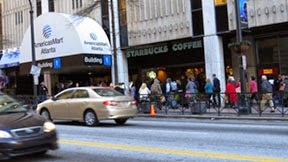 The only solution seems to be to book a hotel room far from the AmericasMart so that there is not the likelihood of losing your room OR arriving early enough so that the room is still available. Because I live on the west coast, the second option is not feasible unless I am willing to take a red-eye flight. • Art and Product Licensing: Thought and Comment from Jim Marcotte - "Atlanta – A Study in Contrasts…and Not"
• Gifts and Decorative Accessories - "Direct from Market: Atlanta Winter 2015"
• J Wecker Frisch "AmericasMart 2015"
• the moon from my atticThe 2015 AmericasMart Atlanta - "The Nation’s #1 Product Destination"
•AmericasMart Atlanta (youtube video) - "The Atlanta International Gift Market - January 2014" Note: The 2015 video will probably be posted on youtube later in the month or in February. • "Art Licensing: 2014 Atlanta Gift Show - the amazing AmericasMart campus"
• "Art Licensing Editorial: 2014 Atlanta Gift Show - insights on walking the show"
• "Art Licensing Editorial: 2014 Atlanta Gift Show - trends"
The health of the gift industry ultimately affects art licensing and the amount of art that is licensed by manufacturers. Thus, successful gift shows (Atlanta and other regional ones) bodes well for the licensing industry. This year seems to have started off well and hopefully that means good news for artists in obtaining many licensing contracts.